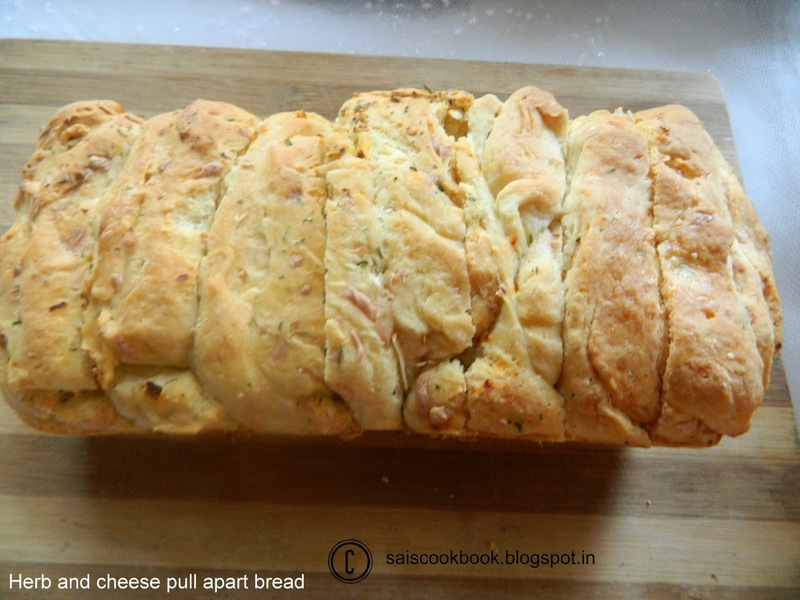 I had seen this pull apart bread in Divya ‘s blog which she had baked for some blog event.I fell for it the first time I saw it.When I went through the recipe with her step wise instructions it looked easy and thought that I should give a try.Though the recipe looks lengthy it is manageable.All we have to do is read and understand the recipe well, that’s what I did.The baking was successful but I could have done a little better.Never mind we learn by trial and error itself. I have managed to click few step wise pictures. In a small bowl dissolve sugar and yeast in 1/2 cup of warm milk,keep it aside for about 5 minutes till the yeast mixture bubbles up. Put 2 3/4 cups of flour,salt,softened butter,garlic paste in a bowl. (You may use a food processor too). Then add the yeast mixture,add 3/4 cup of milk and knead till you have a soft,smooth and elastic/pliable dough which is not sticky. Add a little extra flour if your dough is sticking but only just as much as is necessary.. Shape the dough into a ball and place it in a well oiled bowl,turning the dough to coat it completely with oil. Cover and set it to rise for about 1-1 1/2 hours or until almost double in volume. Dust your work surface lightly with flour,deflate the dough,shape it into a square and roll the dough into a larger square that is 12′ *12′. 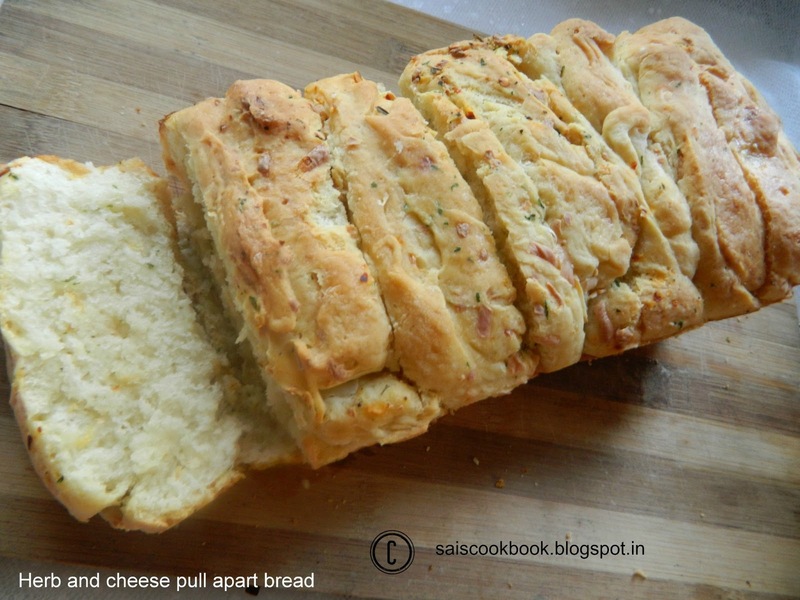 Brush the surface of the square with melted butter,evenly sprinkle with herbs,chilly flakes and the grated cheese. Use a rolling pin to very lightly ,press the topping into the dough to ensure the topping doesn’t fall off when you are stacking with strips. Using a pizza cutter,slice the dough from top to bottom into 6 long and even strips,they do not have to be perfect. Lay each strip on top of the next with the topping facing upwards until you have a stack of the strips. You can put the 2 strips cuts from sides in the middle of the stack so it looks neater. Using a pastry scraper or a sharp knife cut straight down through the stack dividing it into 6 equal pieces(6 squares). 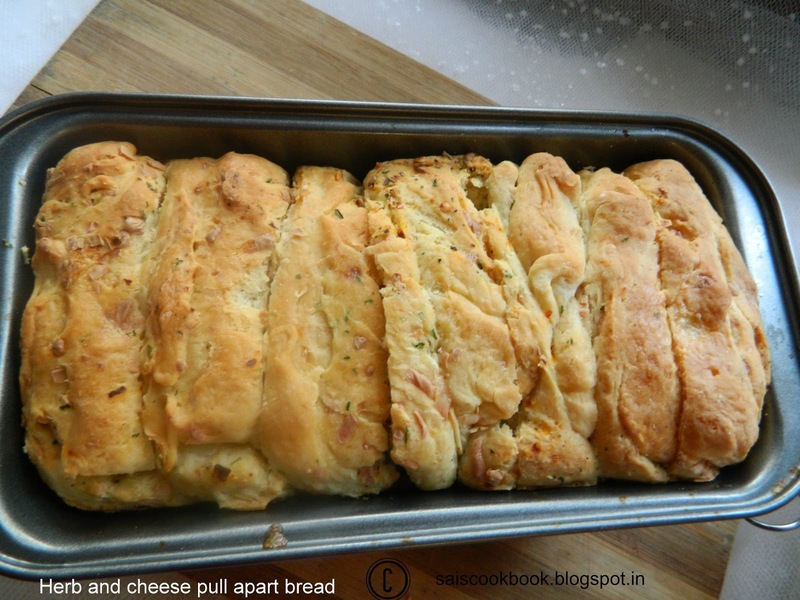 Grease and lightly flour a 9″ * 4 ” loaf tin,layer the square pieces,cut sides down into loaf tin. Cover the loaf tin with a towel and allow the dough to rise for an hour,lightly brush some milk over the top of the loaf. Preheat the oven at 180 deg C and bake it for about 30-40 minutes until it is dark or top turns golden.